When Barnes & Noble expanded its publishing platform Nook Press in 2014 and added a POD service, they forgot to include one key component. 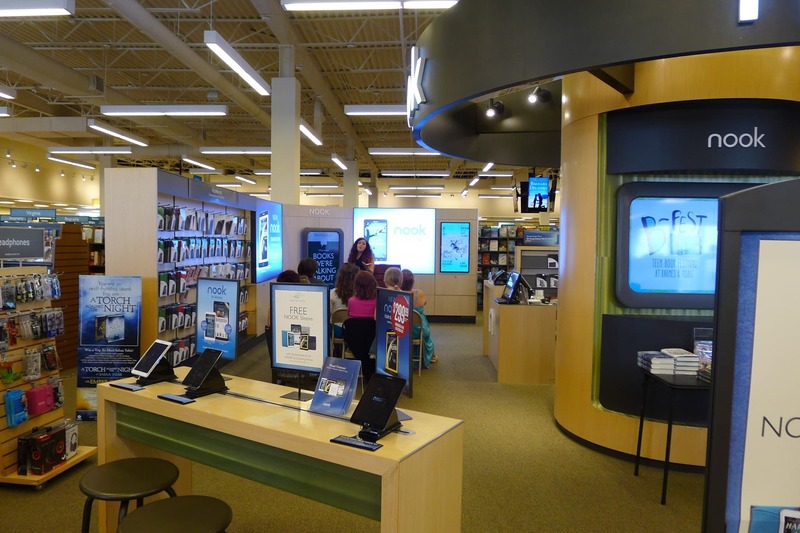 You could use Nook Press to print books, but you could not get them into B&N stores (for that you would need a competing POD service like Createspace or Ingram). Today B&N finally corrected that deficiency. The retailer has launched a quote unquote new Nook Press POD service which enables Nook Press users to create hardback and paperback editions of their title, while at the same time the new program dangles the possibility that the books might be sold in B&N stores. The authors and publishers who distribute their books through Nook Press will have to submit their print books for review by Barnes & Noble’s Small Press Department, and one of the company’s corporate category buyers. They will have to have sold at least a thousand copies of the title in the Nook Store before they will be considered,. If accepted the books might be distributed to B&N stores on local, regional or national level. Interested authors, including the one a few weeks back who railed against B&N for supposedly having a policy against accepting indie authors, can contact [email protected] for more details. In related news, B&N is also opening up an official program where indie authors can apply for the opportunity to participate at in-store events including book-signings and discussions. The authors will be able to meet fans, sell their print books, and build a following. This program also has a minimum requirement: authors have to have sold at least 500 copies of a single title in the Nook Store in order to be considered, and they must be accepted by the local Barnes & Noble store manager. They can contact [email protected] for more details. Those are a great couple of programs, and it's a pity that B&N didn't launch them when they could have mattered - in 2012, say, before Barnes & Noble got into bed with Author Solutions. But in 2016, when B&N has let their ebook program wither to only a quarter of its peak user base, announced four restaurants which push books to the background, and reduced the number of books they carry in preference of pasta and 3d printers, do they really still have a shot at attracting readers into their stores, much less authors? And more importantly, how many authors could qualify for either program? Sure, it would be great for authors to gain a new venue for in-person events; they could even hold an event in the neglected Nook dept, like I saw in the Frederiscksburg store. But the Nook Store has declined to the degree that it is scarcely worth an author's time to use Nook Press rather than a third party distributor. There was a time where authors would have used NP, but many pulled out when we discovered that B&N had hired scammy Author Solutions to run it. Speaking as an indie who was working with Nook Press a while back, I very specifically bailed once I found out they were working with Author Solutions. I have since shifted to deploying my indie titles to B&N via Smashwords. And several other indies I know deploy to them via Draft2Digital, now. And while my sales numbers are not high enough to match the threshold they’re setting here, even if they were, I am very dubious that I’d be tempted back to using Nook Press directly because of them–specifically because of the reasons you outline in the post. With less and less store space to devote to traditionally published books, never mind _self-pubbed_ ones, I would have a hard time buying that any indie author could manage to get traction in B&N stores. The ASI connection would give me pause, too. I know quite a few authors and I don’t know any who sell above the sales threshold set by Nook Press. It seems almost like a token offer rather than one seriously meant to lure in Amazon-exclusive indie authors who sell above that threshold. Now if those threshold numbers were for books sold in a year anywhere, rather specifically through them, that might bring over some authors from Amazon to them that will bring indie books to their sales floor that readers want. It seems to me that they’ve opened this up in a very tentative, timid way during a time when it would do them little harm to make a bold move to swipe some popular authors from Amazon exclusivity.